Short Rib Ragu?! Who am I right now, making SHORT RIBS? I am a pillowy-gnocchi-loving-pasta-eater, that’s who. Carbs 100% dictate my life, and my current carbs wanted short rib ragu. Did you know that short rib ragu is so good, end of story, but also not end of story because it just takes pasta to a whole nother level? Saucy, tangy, and just so tender and luscious all at the same time? This was a new discovery for me. As a less-savvy meat cooker (<- this is who you’re dealing with), I was a little intimidated by making short rib ragu. But then I remembered how we had this at our dinner club all those years ago, and I remembered how good it was with our tiny pillows of homemade gnocchi, and then I got brave with it because a) Instant Pot, and b) food motivation. So that’s what’s happening today – short ribs, short cut, Instant Pot, RAGU! Starting with the short ribs. We’re starting with the saute function on the Instant Pot to get a nice browning on the short ribs. Okay, then something magical happens. You have all the browned bits in the bottom of the pan, right? So you throw some onions and garlic in, and you start working those browned bits off into your sauce. Oh my gosh, YES. Did I already talk about magic? A splash of red wine pulls all your browned bits, sauteed onions, garlic, and spices into something so good that it should be illegal. Now the shortcut part. Add your short ribs back in with a jar of your favorite tomato sauce (we almost always use DeLallo at our house because TRUE FLAVOR and NO ADDED SUGARS). And now the Instant Pot gets to work. One hour later? This is what is sitting in front of your face. You are your own favorite person right now for making this happen. Instant Pot Short Rib Ragu, guys. It’s a little short-cut-y, a little weeknight-friendly, and MEGA DELICIOUS. Put this on anything – rice, potatoes, polenta, pappardelle or penne, maybe some baked rigatoni? But also, stand by because there is a homemade gnocchi tutorial coming soon, and I have to say, those little dumplings from heaven are kind of my favorite. Instant Pot Short Rib Ragu! Ready in an hour. AMAZING on gnocchi, pasta, polenta, rice, potatoes, and more. Get ready: Turn instant pot on to the sauté setting. While it heats up, trim any excess fat from the short ribs, then pat dry with a paper towel. Generously season the meat with salt and pepper. 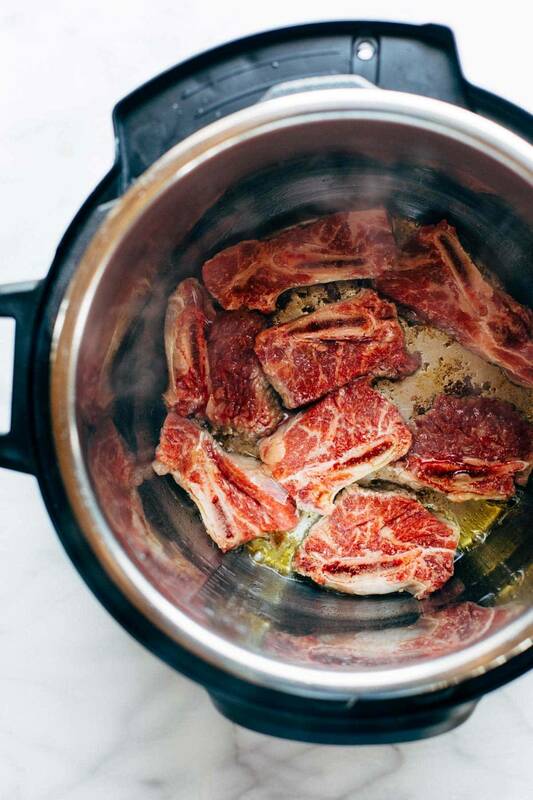 Brown those short ribs: Add oil to the Instant Pot. Add the short ribs to the hot oil and sear on all sides until brown. (The meat does not need to be fully cooked. Just browned.) Remove from pot and set aside. Onions, garlic, and wine: Use tongs & paper towel to remove any excess oil from the pot. Add onion and garlic and sauté until tender, about 3 minutes, scraping the browned bits off the bottom of the pot. Pour wine in to deglaze (*sizzzles*) and cook for about 2 minutes. Go-time: Add short ribs, tomato sauce, salt and crushed red pepper to pot. Use 1/2 cup water to rinse out sauce jar and add to pot. Set Instant Pot to the stew/meat setting (35 mins). When it’s done, let it sit untouched for a natural steam release. Finish up: Remove meat to sheet pan. Shred into bite size pieces, removing bones and any large pieces of fat. Meanwhile, set the Instant Pot to sauté again to reduce/thicken the sauce. Skim any fat off top of sauce and add meat back in. Taste and add salt & pepper if needed. Yummmo! Slow Cooker Instructions: Do steps 1-3 in a pan on the stove, and cook everything in the slow cooker on low for 8 hours. Initially, the meat will stick to the stainless surface of the Instant Pot, but once it’s got a nice sear on it, it should release pretty easily. If you make this ahead of time and store it in the fridge, a lot of the fat will rise to the top and turn solid. This makes it easy to remove. Great recipe! Thank you for the tips! I haven’t been into meat since getting pregnant, but this sounds good for when that phase passes! I’ve never tried short rib ragu before but this looks amazing! Could this be made in a crock pot as well? Yep! Just added directions for that. What are cooking instructions for a slow cooker? This sounds amazing but I have no Instapot. Thanks!!! As an avid follower of your blog, I can't emphasize how much I love seeing a recipe that isn't vegetarian on here. But when you do what you just did with those short ribs above, my heart just skipped several beats and all I can say is dang lady, those ribs are a MAJOR OOMPH BOMB!!! 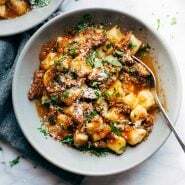 Look forward to your gnocchi recipe with this spectacular short rib ragu! Thanks, Lavina! 🙂 Hope you enjoy it! This looks incredible! Would normally be very intimidated cooking short rib but all over this this weekend – I am guessing it can maybe made in a slow cooker but with a much longer cooking time? Correct! Just added slow cooker directions to the notes. HI! This sounds great! The picture makes it look almost like there’s pasta or chicken? Am I missing an ingredient? Nevermind! 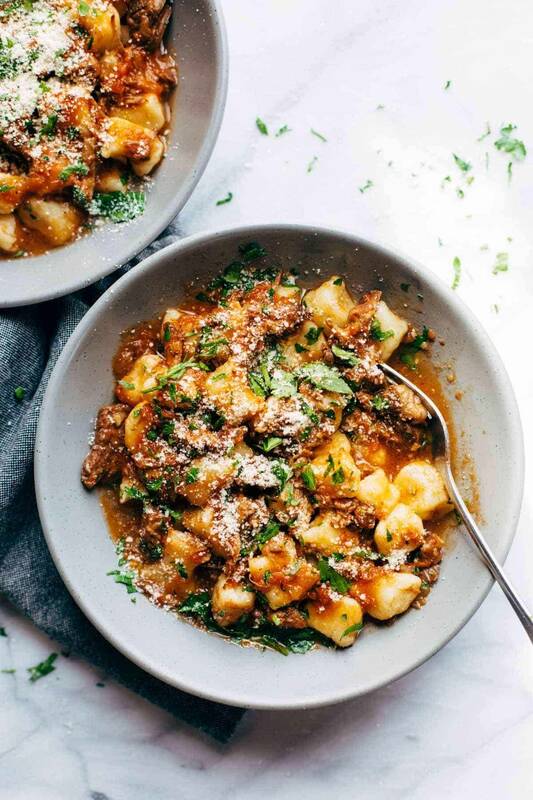 i see your post talks more about what to eat with the ragu .. i’ll assume this is gnocchi in the photos. That’s correct – it’s gnocchi! Can you provide non-instant pot option? Don’t have one but would love to try this!! Just added slow cooker directions to the notes! I love short ribs and this rags looks irresistible! Quick Instant Pot question for you: I have not jumped on the bandwagon yet, but I borrowed a friends’ Instant Pot for a week and my one complaint was that I just didn’t get the depth of flavors that you would if you braised or slow cooked something and gave it hours for flavors to develop. Do you experience this or do you “over” season to compensate for this at all? Thanks! Hi Mercedes! We’d agree that it can be true for certain recipes (though this one has great flavor!). We mostly love the Instant Pot for quick dinners and hands-off cooking (you can get it all in there and then just put your feet up while it cooks!). Totally depends on your preference for cooking and flavor. Hope you give this one a try to see! How would I convert this for a Dutch oven? I’m guessing you’d probably want to braise 4-6 hours. Yum! Short ribs are so delicious! Yes! Just added slow cooker directions to the notes. Any suggestions to replace the wine? I’m pregnant and the idea of opening a bottle for 1/4 cup won’t work for a bit. What about getting a smaller bottle of wine? I’ve seen individual servings at the store before – like a 4-pack of tiny bottles or a “copa di vino” style! you realize that cooking the wine removes the alcohol.. I think she meant, why open a whole bottle of wine when she only needs 1/4 cup for the recipe and can’t polish off the rest. made this using the slow cooker instructions and it was SO YUM. the only thing i’d change for next time is to reduce the water to 1/4 cup because I like a thicker sauce but that’s just me. thank you for a yummy and easy recipe! Made this tonight and it was fantastic! Also, if any of you are impatient like me, I used the Quick Release and the meat was still fall-apart tender. Can this be made with marinara sauce? I have a bottle of Rao’s and wasn’t sure if it would turn out okay. This looks amazing and simple to make ! have to try this with your homemade gnocchi. I just made this and the short ribs weren’t anywhere near tender enough to shred after following the instructions. Putting it back in the instant pot for another 10 minutes of pressure and crossing my fingers. Sorry to hear that, Julia. Hope that helped! This meal was insanely rich and made enough for two dinners (half is frozen in the freezer now). We tried it with both gnocchi and pappardelle pasta and enjoyed both (youngest doesn’t like gnocchi). It’s definitely a comfort food dish or a special occasion meal that pairs nicely with a salad. My partner used the instant pot and said it was easy and came together nicely. 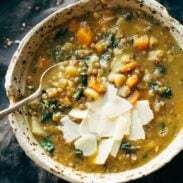 This recipe is going into our collection of favorite meals and I look forward to eating it again. I shouldn’t know this, but I’m getting an Instant Pot for my bridal shower next weekend, and I am taking it STRAIGHT HOME and making THIS EXACT DISH. I’m so excited I could cry delicious savory tears! How exciting! Hope you enjoy it! Wonderful recipe! lovely I am gonna try this dish this weekend. Blog ! they way your presented is so nice. Keep Posting. So. Stinkin. DELICIOUS. Not kidding, I have made this 3 times in the last month-ish since it was published. We even did the interactive dinner party activity but with homemade pasta instead of gnocchi, so much fun! Love this recipe! Update: Made it for my cousin & his girlfriend while they were visiting last week and they both said it was the best pasta they’ve ever had. Seriously, this one is a winner! So glad to hear that, Rachel!